Following a busy October for pre-sales, November was another active month and saw nearly 1,300 homes come to market, 38 per cent of which were sold. The months of October to December are expected to be the busiest quarter of the year for project launches, with over 5,400 units expected to come to market. Over the course of 2018, we saw same month sales peak in January, with a 94 per cent sales rate. On average, same month sales have normalized to a 40 per cent sales rate. Five high profile concrete towers are expected to launch before year end. 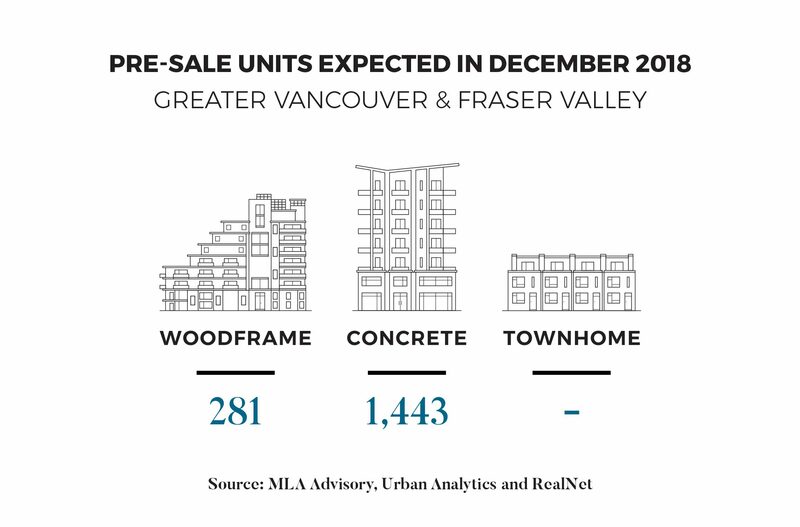 MLA Advisory anticipates over 1,440 concrete units and 280 woodframe units will be released to market in December. Click here to read the full December Pre-sale Insights Report.